Disclosure: I posted this recipe for a contest with Siggis a few years back and was provided with free product samples, but not compensated for my time. I didn’t win, but it’s still a pretty dope recipe. The recipe was originally posted November 2015 and photos, content and recipe have been updated to bring you the best possible content! Can you think of a more comforting fall dessert?? I know Thanksgiving is supposed to be all about pies, but if we’re being honest, I’m not a huge pie person. There are exceptions. 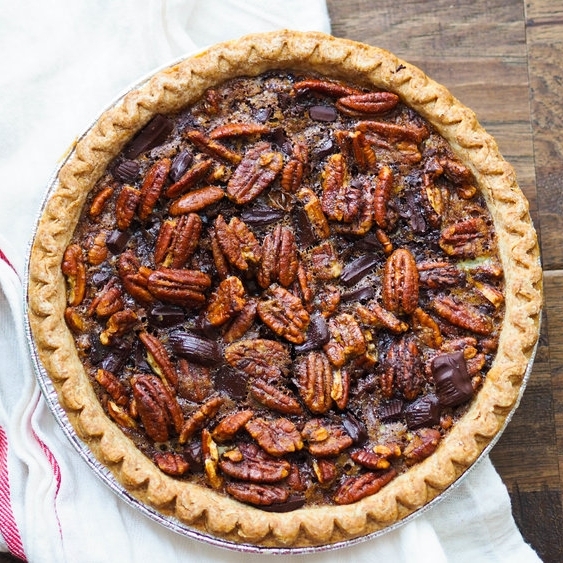 Tupelo Honey’s brown butter pecan pie is the stuff dreams are made of (and my dark chocolate pecan pie is pretty darn good too). And I’ll never turn down a brownie pie. Also, savory pies are just one of the most perfect things on this planet. But traditional Thanksgiving pies, like apple and pumpkin? Meh. 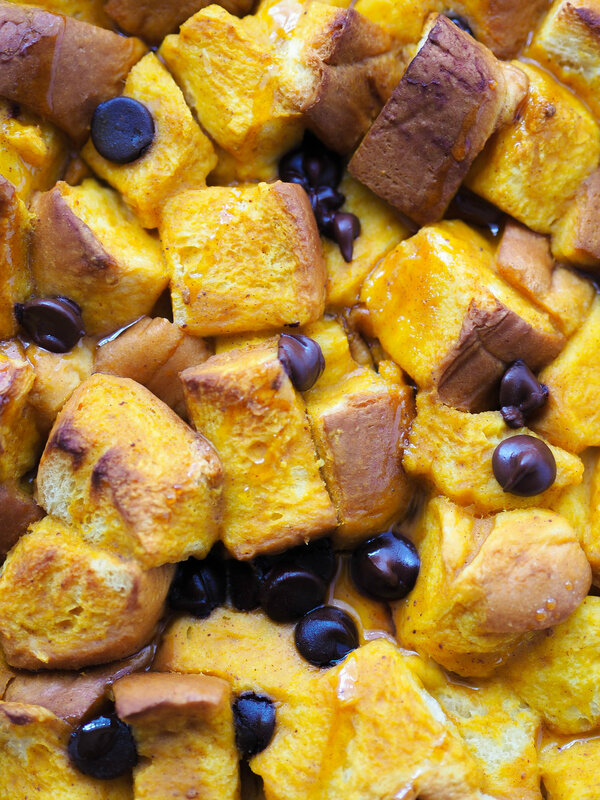 That’s where this pumpkin coconut dark chocolate chunk bread pudding comes in. So many adjectives I like in that title. Was gonna throw brioche in there but that felt a little braggy. 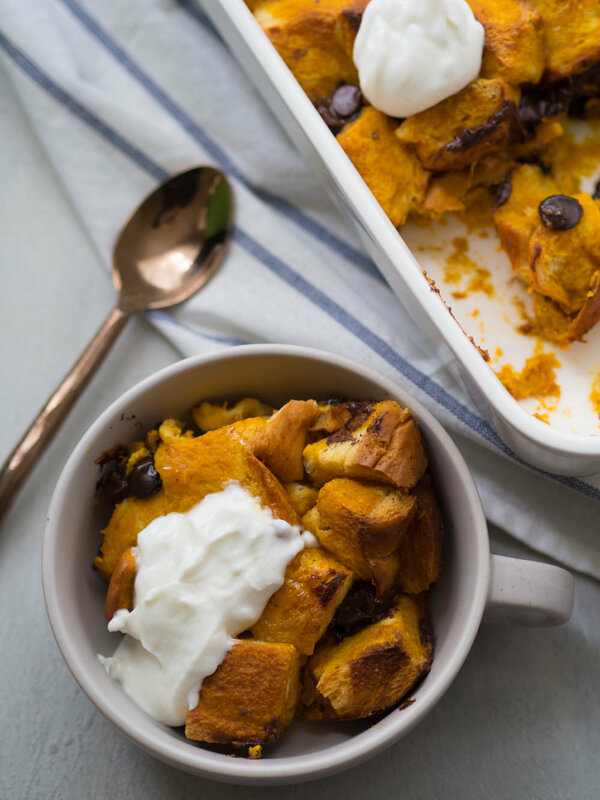 This bread pudding is one that you can throw together the night before Thanksgiving and let it soak in the fridge, then bake off as you’re eating the main meal. I love it drizzled with a little more maple syrup and dolloped with coconut Siggis skyr, which also goes into the pumpkin mix. I like to use brioche to make this pudding because of it’s sweet flavor and fluffy texture. It’s helpful to let it stale up a bit before making this dish, but I usually forget when I make this and it’s fine. You can also toast it up for a few minutes beforehand. In a large bowl, whisk together coconut milk, pumpkin, skyr, maple syrup, cinnamon, nutmeg, ginger and salt. Toss in bread and stir to combine. Stir in chocolate chips. Grease a large baking dish or line with parchment paper. Pour soaked bread into the baking dish and let sit to soak at least an hour or overnight. When ready to cook, bake in a preheated 350 degree oven for 30-35 minutes until lightly browned. Let sit to cool slightly, then serve warm with a dollop of coconut Siggi's.